NTN Corporation (hereafter, NTN) has successfully commercialized the “Hydrodynamic BEARPHITE*1” that features a hydrodynamic groove formed on the inside bore surface of oil-impregnated sintered bearings. Its high level of reliability has lent itself to a wide variety of applications such as spindle motors for hard disk drives (hereafter, HDD) and cooling fan motors for electronic devices. NTN has focused on technical development aimed at improving the precision of bearings, developing new materials and achieving further miniaturization to meet the increasing demand for greater capacity HDDs in recent years. As a result, NTN developed and commercialized the “Thin Type Hydrodynamic BEARPHITE” that delivers a high level of reliability and silence for thin fan motor applications*2 used in equipment such as Ultrabooks*3. While there has been increased demand for thinner bearings for fan motors used in Ultrabooks, the same cooling characteristics as conventional fan motors were also required. To achieve this, the impellers (blades) installed on fan motors were increased in size over conventional units, which in turn placed a greater load on the bearing. With Ultrabooks designed for their light weight and portability, the bearings were subjected to a range of different usage environments and rotation conditions, which ultimately called for a high level of reliability under tougher operating conditions. 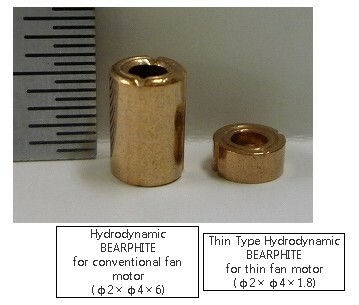 The newly commercialized “Thin Type Hydrodynamic BEARPHITE” features optimized hydrodynamic groove specifications and groove machining conditions for thin fan motors, and uses a newly developed lubricating oil to help maintain the non-contact structure that is characteristic of hydrodynamic bearings, even under tough usage conditions. The resulting product offers a high level of silence and reliability. Sales of ultra-thin notebook PCs such as Ultrabooks remain strong, and demand for thin fan motors is expected to increase into the future as more advanced mobile devices such as tablet PCs are released onto the market. Sales of NTN’ proprietary “Hydrodynamic BEARPHITE” that features a hydrodynamic groove formed on the inside bore surface have now exceeded a total of 1 billion units worldwide. NTN has continually developed bearings that are more compact and offer a lower torque and higher speed, and will focus on expanding sales of the “Hydrodynamic BEARPHITE”. *1 “Hydrodynamic BEARPHITE”: a hydrodynamic bearing that features a hydrodynamic groove formed on the inside bore surface of oil-impregnated sintered bearings. *2 “Fan Motor”: a cooling device installed to limit abnormal increases in temperature by discharging heat generated within computers. *3 “Ultrabook”: the name given to thin, lightweight notebook computers with a thickness of 21 mm or less etc.